Dies R Us: I'll Have A Blue Christmas! I'll Have A Blue Christmas! Wednesday again & time for a bit of inspiration from me today! I don't know how many Elvis fans we have out there, but today's inspiration from me was inspired by his beautiful song, "Blue Christmas" so I decided to go with blues for my card. I think we are all programmed to think of Christmas cards as mostly reds & greens, but some of the non-traditional colors are gorgeous too! 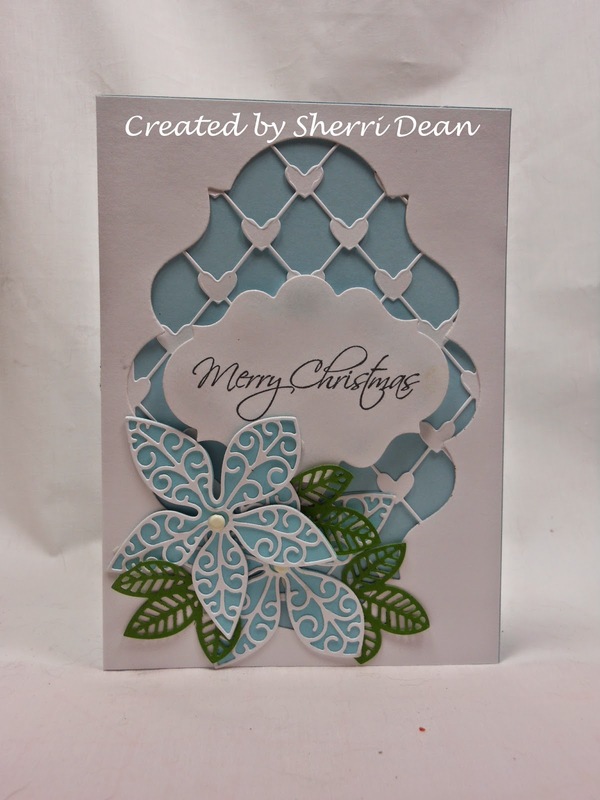 I used the following dies for this card: Poppy Stamps Small Luxe Poinsettia Background, Poppy Stamps Small Luxe Poinsettia Outline, Spellbinders Labels Twenty, Poppy Stamps Heart Lattice Background, & Sue Wilson Faux Quilled Leaves. To get this gorgeous background effect, I cut a piece of white cardstock the same size as my card front & placed my Spellbinders Labels Twenty die directly in the center. I kept the center portion to use at a later time & grabbed the cutout & set it aside. When I cut this card, I used blue cardstock to eliminate one extra layer. By cutting out the Heart Lattice Background and gluing that directly on top of the blue card, I just had to add the final layer I made with the Labels Twenty die. I bought the poinsettia dies to layer separately, but decided at the last minute to actually glue them together only to make them easier to mail. The rest of my cards will have the leaves separate and shaped with my stylus for a totally different look. Try both versions to see which YOU like! That's the fun thing about dies, there is no wrong or right way to use them! Be sure to check out the Dies R Us Store for the most complete variety of dies, stamps & embossing folders you can find anywhere! As well as the lowest prices AND lowest shipping rates!! For even more fun, head on over to the Dies R Us Challenge Blog where a new "Halloween" challenge is starting today! You could be the lucky winner of a gift certificate! Check out the other designers here too! See you next week! Until then, be sure you spend at least one day creating something beautiful! OMG Sherri this is such a fabulous design! LOVE IT! Thanks for always sharing such wonderful inspiration! Great card Sherri! Love the quilled leaves die, must order, LOL. Gorgeous Sherri! Beautiful designing with all these dies! love it! The Star of the Show! Blue Christmas . . .
Blue Birds singing . . .
Christmas is coming . . .